While it’s certainly possible to visit the Walt Disney World theme parks carrying little more than your wallet and your cell phone, there are many situations in which a visitor might want or need to tote heavy or bulky items with them into the parks. If you’re in camp two, the Disney parks lockers can be a lifesaver. 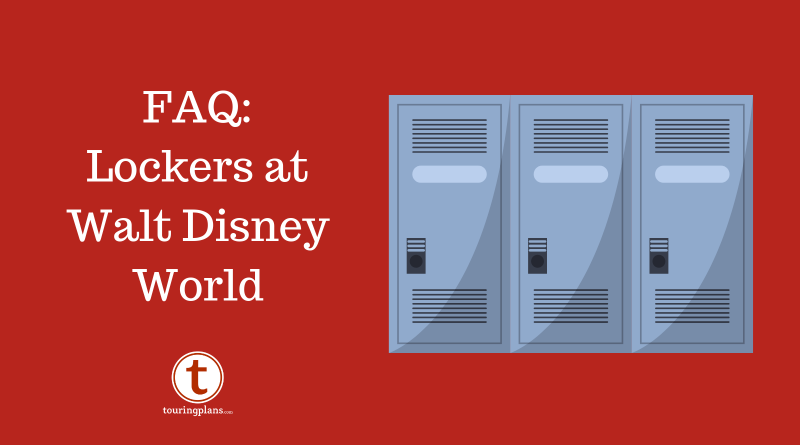 Here’s what you need to know about the locker situation at WDW. Magic Kingdom locker room, located at the right side of the park entrance. Where are there lockers at Walt Disney World? 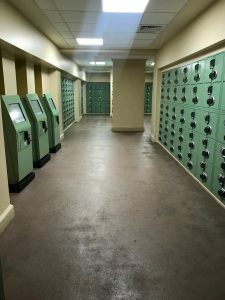 Lockers for guest use can be found at Disney’s Animal Kingdom, Disney’s Hollywood Studios, Epcot, Magic Kingdom, Typhoon Lagoon, Blizzard Beach, Disney’s golf courses, and at some Disney resorts, typically those with marinas and/or health clubs. Will I need to use a locker at the theme parks? You are planning to bring in a substantial amount of food into the park. In addition to being a storage area, the lockers may be a bit cooler than the temperature out in the parks. You are going to/from the theme park to another venue which requires different clothing. For example, if you’re going straight from a theme park to a signature restaurant and want to bring a nicer outfit for your meal. Similarly, if you’re arriving at the Magic Kingdom early in the day and will be attending Mickey’s Not So Scary Halloween Party in the evening, you want want to store your costume in a locker rather than cart it around all day. You’ve made a large purchase at one of the theme park gift shops and the timing does not work out for using either package pick-up or resort delivery. You’re visiting at a time of year when there are vast temperature changes. You need a bulky jacket first thing in the morning, but don’t want to wear/carry it when it warms up later in the day. You simply prefer not to carry your gear with you. 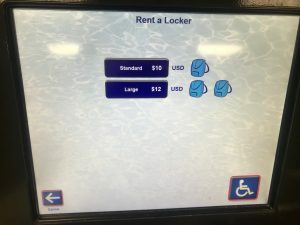 Locker rental takes place at an electronic kiosk in the locker room. What size are the lockers at the theme parks? The four theme parks (Epcot, Magic Kingdom, Animal Kingdom, Disney’s Hollywood Studios) all have two sizes of lockers available inside the park. Large lockers are 15.5″ x 13″ x 17″. Small lockers are 12″ X 10″ x 17″. At Magic Kingdom and Epcot ONLY, there are also Jumbo size lockers which are 17″ x 22″ x 26″. How much do these lockers cost? The prices are the same at all the theme parks. Prices can change, but currently the large lockers rent for $12.00 per day and the small lockers rent for $10.00 per day. Jumbo lockers (only at Epcot and Magic Kingdom) are $15.00 per day. That seems a little steep. 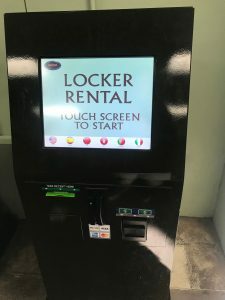 Is there any way to save money on a locker rental? There used to be only moderately inconvenient workarounds that involved using lockers located just outside the park gates. That option is now gone (more on that in a sec). There are less expensive small-size lockers near the pool at the Contemporary, but getting to/from the Magic Kingdom and that location takes at least 10 minutes each way, plus time in security line. It’s not really a practical option. If the reason you’re renting a locker is to store purchases made in the parks, you can instead use the package pick-up service that will hold items for you at the front of the park until you’re ready to leave. Be sure to ask about this at the point of purchase. If you have need for a locker during several days of your trip, and the items you’re carrying are not precious (packed lunches, for example), an out-of-the-box workaround would be to buy a stroller. A quick search on Amazon, Target, and Walmart brings up dozens of umbrella-style strollers priced under $30, and even a few priced under $20. There’s no requirement that you must have children with you to bring a stroller into the Walt Disney World parks. Carrying a heavy bag of food on a $20 stroller reaps savings after just two days of not spending money renting a locker. There are two sizes of locker at Animal Kingdom and Hollywood Studios. There are three sizes at Epcot and Magic Kingdom. What are the specific locker locations at each park? Magic Kingdom – Lockers are under the train station, just past the park entrance, on the right. Epcot – Two locations: Near the main entrance, bear right at Spaceship Earth; lockers are near the restrooms to the right of the Spaceship Earth attraction. Additional lockers are to the left of the International Gateway park entrance between the England and France pavilions. Disney’s Hollywood Studios – Next to Oscar’s Super Service, just past the entrance, to the right. Animal Kingdom – Next to the Guest Services window, just past the entrance, to the left. What are the locker hours? They’re the same as the theme park hours, plus any Extra Magic or party hours. In 2017, Disney World replaced all of the key-operated lockers in the theme parks. 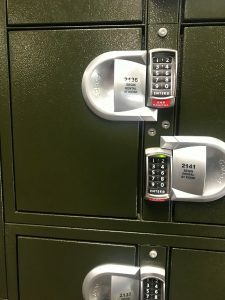 The lockers are now entirely electronic. Each locker location has one or more rental kiosks that look similar to an ATM. The rental transaction may be completed in English, Spanish, Portuguese, Italian, Japanese, and Mandarin. Press a touch-screen to begin your transaction. First, select your preferred size locker. 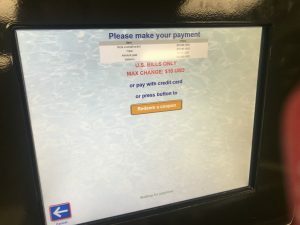 You will then be prompted to pay, with either U.S. cash (bills only) or with a credit/debit card. After you’ve paid, you’re prompted to create a 4-digit access code that will be the combination for your locker. The kiosk screen will then tell you which locker is yours. Pro tip 1: Make sure you choose a locker combination you’ll remember. Pro tip 2: Be ready to write down your assigned locker number, or take a photo with your cell camera. At the end of long day, it’s extremely easy to forget which locker is yours. Then walk over to the locker you’ve been assigned, use the keypad to input the code you selected, and the locker will open. Create your own locker access code. I only have my MagicBand with me as a payment method, no cash and no credit or debit card. Can I still pay for a locker? If you’re in this situation, or if you want to pay for a locker with a Disney gift card, go to the merchandise sales location nearest the locker room. They can create a transaction with your MagicBand or gift card and give you a code to use on the locker room kiosk. 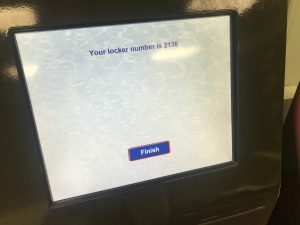 The kiosk assigns you a specific locker. Can I go in and out of my locker several times a day? 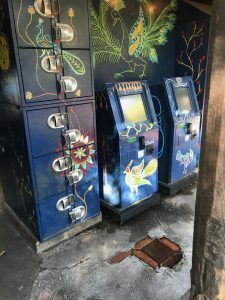 There are some coin-operated lockers located at the resorts. These require a payment every time the locker is opened/closed. What happens if I’m visiting more than one park per day? Do I have pay the locker fee twice? Yes. While you can go into and out of your locker many times per day, if you switch theme parks (Park Hop) and want to get a new locker at the new park, you’ll have to pay again. Prior to the 2017 locker replacement, guests paid for their lockers at a manned register and were given a printed receipt. This receipt allowed guests to get a new locker at another park at no additional charge. This procedure in no longer in place. There is a keypad at every locker. If I’m going to the same park two days in a row, can I leave something in the locker overnight? Unfortunately not. The lockers are cleaned out every night. Depending on the locker contents, items left at the end of the day will either be trashed or sent to lost and found. I thought there were lockers just outside some of the park entrances? What happened to those? 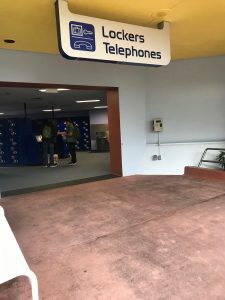 In the past, there had been lockers located at the Transportation and Ticket Center and near the bus loading areas at Epcot and Hollywood Studios. Those have been removed. The only lockers at the parks are within the park gates. From a security perspective, this makes complete sense. Can I leave a rolling suitcase in a locker at Epcot or Magic Kingdom? Probably, but you may run into some headaches. Remember that when you bring your suitcase into the park, you’ll have to go through the regular security screening. Nothing in your bag can violate the rules stated on Disney’s rather extensive list of prohibited items. Personal items that could trigger scrutiny are razors, anything in a glass container, medical marijuana, selfie sticks, and a host of other items. Disney also has a prohibition on items that you pull behind you. However, if you explain that you’re taking your wheeled suitcase directly to a locker, they may waive this rule. All of this is up to the discretion on the security staff on duty. That all seems like a pain. What reason would I have to store luggage at a theme park? First, let me tell you why you wouldn’t need to store luggage at a theme park. If you’re staying at a Disney resort and taking Disney’s Magical Express to the airport, you have to go back to your resort before you leave. In this case, you should leave your large carry-ons with the Bell Services at the hotel. If you have large bags that will be checked, you can either leave these with Bell Services or send them to the airport ahead of you using Resort Airline Check-In. If you’re leaving Walt Disney World directly from a theme park by car, you should leave your luggage in the car. It’s your last day. You only have carry-on luggage. You’ve taken a cab/Uber/Lyft to a theme park for a last bit of fun and don’t want to go back to your hotel before taking a cab/Uber/Lyft directly from the park to the airport. You’re traveling home using a bus service that collects guests from a theme park. Are lockers readily available at the theme parks? Generally, yes; however, at the busiest times of the year, it is possible that they may run out of lockers or run out of the particular size locker that you need. If you absolutely need a locker, rent it early in the day. 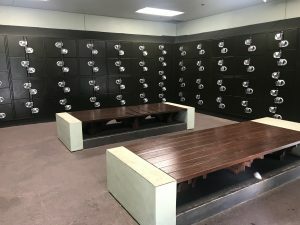 Are there lockers at Disney Springs? Back in the days of Downtown Disney, there had been coin-operated lockers at that location. 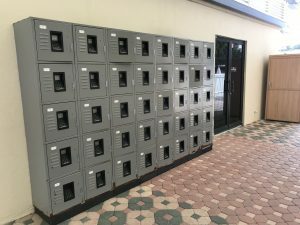 They have since been removed and there are currently no lockers at Disney Springs. As at the theme parks, some shops will send your purchases to your Disney resort hotel for you. Be sure to ask when making your selections. What’s up with lockers at the water parks? The Blizzard Beach and Typhoon Lagoon lockers now use the same electronic system as at the theme parks. Small lockers are 12″ X 10″ x 17″, priced at the same $10 per day as at the theme parks. Large lockers are 15.5″ x 13″ x 17″. While the large water park lockers are the same size as the large theme park lockers, they are priced at $15 per day. That’s $3 more per day than at the theme parks. Lockers at Disney’s Hollywood Studios. 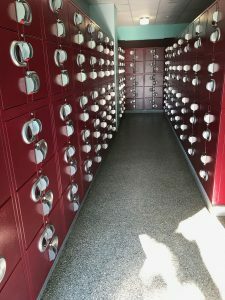 While guest use of the theme park lockers is quite variable (many guests will not need to use a locker), given the nature of a water park, many more guests will be in the market for a locker rental. You may feel safe leaving your towel and John Grisham novel on a your poolside chair, but you’d be foolish to leave your wallet and cell phone there while you’re swimming in the wave pool. Build a locker rental into your budget to keep your valuables safe. I’m renting a boat at the Contemporary. What do I do with my belongings that I don’t want to get wet? The hotels that have marinas also have free or coin operated lockers near by. Some of the resort pools also have this feature. I’m going on the Wild Africa Trek at the Animal Kingdom. I don’t want to bring all my belongings on the Trek, should I rent a locker near the park entrance? No need to do this. There are special lockers just for Wild Africa Trekkers. There is no additional charge for these. Your Trek guides will show you where they are when you check in for your adventure. I’m going on Kali River Rapids at the Animal Kingdom. I don’t want my belongings to get wet. What should I do? There are low or no-fee lockers at some locations outside the theme parks. These are at the Contemporary Resort marina. The lockers are the same small/large sizes as at the front of the parks. The small lockers are free for up to two hours of use. The large lockers are $4 for up to two hours of use. Are my belongings safe in the Disney lockers? I’ve never personally heard of anything being stolen from a Disney parks locker. However, they are lockers, not Fort Knox. You should plan to keep irreplaceable or valuable items on your person. Better yet, bring the bare minimum of valuables with you to the parks and leave the rest in the safe back at the hotel. I have a medical issue and can’t reach the top lockers, what can I do to make sure I’m not assigned one of those? 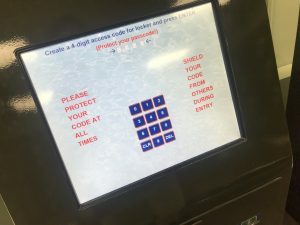 On the kiosk screen where you’re asked to choose what size locker you want, there’s also a wheelchair icon. If you need a lower locker, touch the wheelchair and you’ll only be assigned a locker in the handicapped-accessible zone. I’m also visiting Universal Studios, is the locker situation the same there? No. Guests are allowed to bring personal belonging with them on all rides at Walt Disney World. However, there are a number of rides at Universal where you are not allowed to bring anything, even small purses, on the ride with you. You are required to use a free locker at these locations. There are also larger paid lockers at the park entrances. See our deep dive into the Universal locker situation. So fellow sherpas, do you carry all your gear with you in the parks? Do you rent lockers on a regular basis? Why or why not? Let us know in the comments below. WDW September Park Hours Updated!